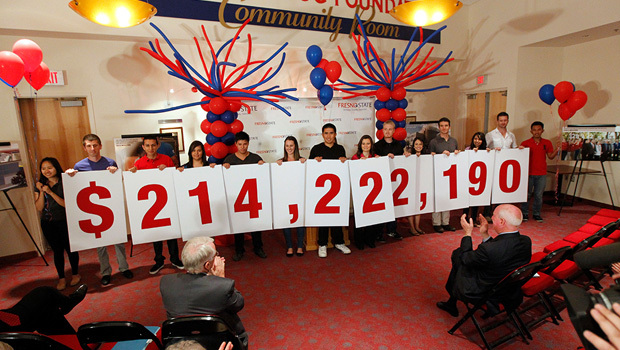 University officials announced that the Campaign for Fresno State raised a total of $214,222,190 in support of scholarships, faculty, programs and facilities. The final figure is more than 7 percent above the $200 million goal set in 2005. The Campaign for Fresno State is the first comprehensive fundraising campaign in Fresno State’s 102-year history and among the largest in the California State University system. “Declining state support for public higher education elevates the importance of private support to enhance our university’s academic mission, research components and the community good,” said Peter Smits, Vice President for University Advancement, whose division staffed the Campaign. During the nearly eight-year campaign, 34,629 donors made a total of 163,212 gifts. 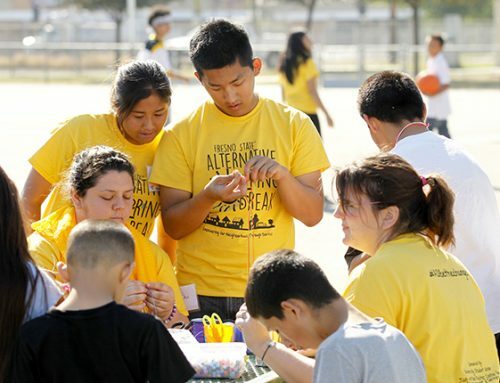 Donations ranged in size from $25 gifts from alumni just embarking on their careers to multimillion dollar gifts that established programs, named colleges, created endowments and built new facilities. The fundraising total was announced April 20, 2013, in conjunction with a gala at the Save Mart Center celebrating the career of President Welty, who will retire this summer. When the Campaign launched in 2005, community leaders Jan and Bud Richter volunteered to lead the effort as co-chairs. In 2009, alumni Omel Nieves (1983) and Dennis Woods (1969) took over as co-chairs of the drive. “Every corner of the Fresno State campus has been touched by the success of the campaign,” said Woods. One of the most noticeable examples of philanthropy on campus is the Table Mountain Rancheria Tower at the Henry Madden Library. The Table Mountain gift financed the design, landscaping and furniture enhancements that make the tower an architectural landmark, and will also fund a new directional signage system for the campus. The Jordan College of Agricultural Sciences and Technology attracted the most money, raising more than $51 million. The gift from the Jordan family was the largest single cash gift in the history of the CSU and will finance a 30,000-square-foot research center, targeted to open in fall 2015. Donations to the college also paved the way for the new Rue and Gwen Gibson Farm Market and Foster Farms Poultry Education and Research Facility. Both buildings opened in March 2013. Fresno State Athletics generated more than $45.8 million in support during the campaign. The program received nine gifts of more than $250,000, including support from the Chukchansi and Tachi Yokuts tribes. Student-athletes are also enriched by the Meyers family, whose generosity provided for the state-of-the-art Meyers Family Sports Medicine Center, set to open in August. A multitude of centers and programs were born out of the campaign, including the Center for Creativity and the Arts, the Gazarian Real Estate Center and the Dandoy Center for Excellence which supports faculty development and leadership in education. The university’s faculty leadership grew thanks to two Bronco Wine Chairs in the Department of Viticulture and Enology, the Roshan Professorship in the College of Arts and Humanities, the Robert Duncan Nicol Endowed Chair in the Silent Garden for the Department of Communicative Disorders and Deaf Studies and the Pistachio Physiology and Pomology endowed professorship from the California Pistachio Research Board. “Every gift has a lasting and critical impact on our university, but perhaps the most profound effect of the campaign is how it enabled hundreds of students to achieve the dream of higher education through privately funded scholarships,” said Woods. Opportunities like the Husband-Boeing Honors Scholars program in Engineering, the Smittcamp Family Honors College, Jensen scholarships, Cook nursing scholarships, Brown liberal arts scholarships, Alice and Paul Vincent scholarships, Verna Mae Brooks scholarships and Harvey scholarships provide life-changing support to students every year. While the campaign officially concluded March 31, 2013, university officials say efforts to secure private support will be ongoing.